Happy New Year! I hope you’re enjoying your 2016 so far. We have had a relaxing and fun two weeks of vacation at our house, and are a little sad that we had to go back to the real world today. The kids still have one last day of vacation today, but they go back to school tomorrow. I got to play with some of the new Occasions catalog goodies the past couple of days. One that I was eager to break out was the Sunburst Thinlits die. It reminded me a little of an old quilt pattern of my grandmother, who made many, many beautiful quilts during her lifetime, so I went in that direction for my first card with this die. I used some of the pretty papers from the new Have a Cuppa Designer Series Paper Stack. I love the colors and cheery patterns in it. I also used one sheet (the green one) from the Cherry on Top dsp stack. I started by sponging on some Crushed Curry ink onto a Whisper White card base. I then used the sunburst die to cut out a sheet of dsp in each of the colors. I cut off each ray and then selectively placed them on the card base. 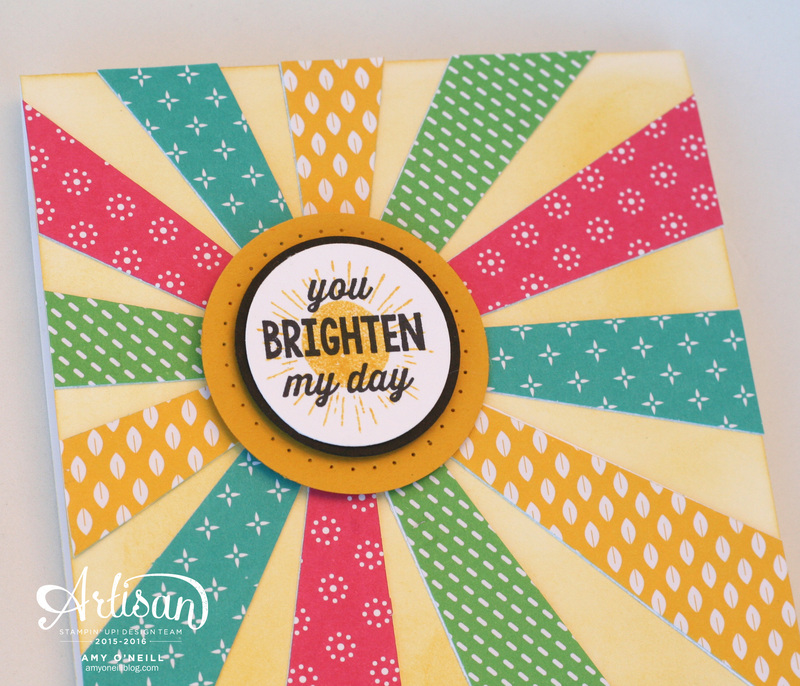 The sentiment comes from the Sunburst Sayings stamp set, and the sun stamp is from a new Project Life set called Memories in the Making. All of these fun products will be available starting tomorrow! A great way to start the new year! This entry was posted in Memories in the Making, Sunburst Sayings. Bookmark the permalink. Love the burst of color! I liked this set when I first saw it now, I love it! Thank you so much for sharing!